I saw a lot trolls this season (at my league and some of my friend). I don't manipulate the draw. 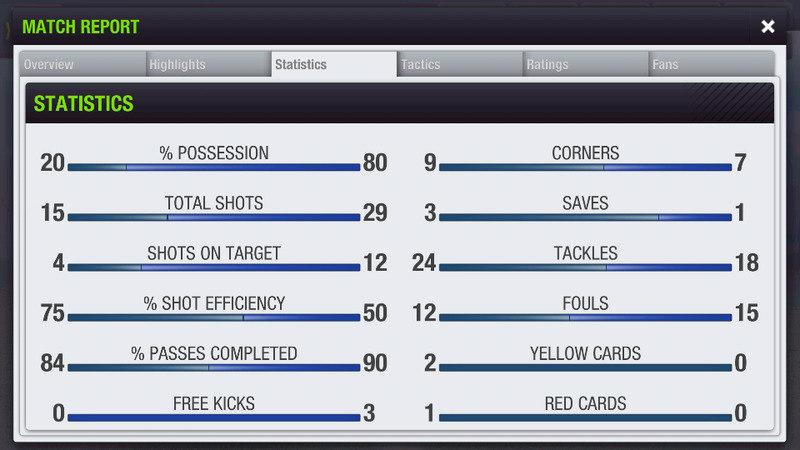 I don't have the details from last season, but I lost both Cup & Champions League Quarters - drew at home & lost away in both to teams with 20 - 30% less ratings than mine, whereas I dominated league & group stages, even against similar rated competition. I had about 130+ rating throughout. All other factors, from win bonus to morale (like that even matters smh) being as well maintained as possible, with tried & tested formations & me ever present. I won 6:3 eventually, but look at what I was up against. A 5 - 5 team, with no manager present. 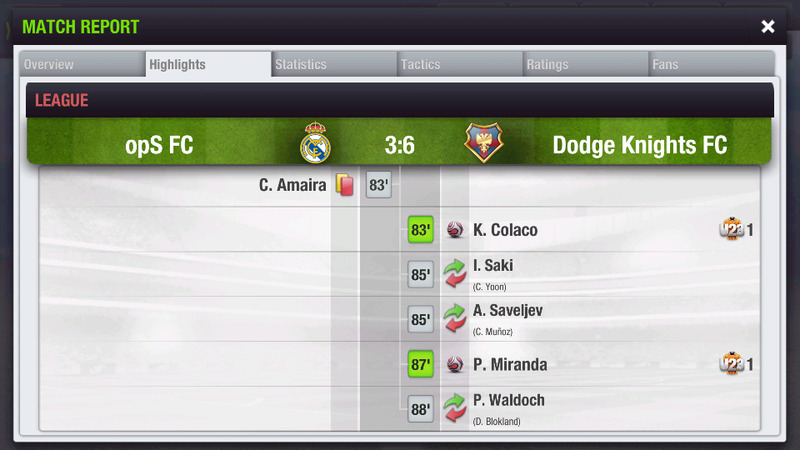 While 3 goals might not be a big deal, I rarely concede even against the best of teams. How a team with 20% possession & supposedly 0 players in attacking positions gets in 3 goals & so many shots, is beyond me ! Tyltyl, Ozz and madflo19 like this. Depends on what is called troll result. Losing being 14% stronger, draw being 20% stronger, 4-0 win 3% stronger arent troll result for me. Then I have zero this and last two seasons. Those are too many but I wonder if it was a "bad" season, something happened to your "key" players or don't know what else. What we 're searching for. If something broken the latest months. 1) You mentioned about 1-2 games which was your finals. A team, an oppo who reached the finals deserves some respect. Even if he has lower quality or not using the perfect formation or been present in the games, he has some chemistry, he has built a team that for some reason can destroy any opponent. Is this factor overestimated ? Considering that a big part of that, comes from the +8% of our presence, our supporters and the 5% from home game/tickets. 3) The stats are broken, not the game. What I mean is that the stats we see aren't the real ones. the next weird thing is the efficiency, the broken balance between the Shots, the SoT and the successful shots. But if those numbers are wrong ? If (despite the ball possession) the number of the shots and the SoT are very similar ? 4) Another one factor, is that the teams from +1LV, have some hidden bonus (that's my theory from experiences) which give them higher efficiency than our team (which maybe can have the same quality with oppo). So now that most of the active managers are playing vs managers from a +1 lv (in the Cup and the CH.L. or Super League) but maybe not so active, this multiplies the troll issue. dsio, funqer, MiddleEarth and 1 others like this. dsio and ChaosManager like this. Hey hello I just want to say wherever you are, God bless you man just for opening the thread and willing to put something on the front table. As for the evidence, good people over here at the forum will already be posting it. What the current scenario is I have 25 good players on the squad, but I am bound to use only 12 to 13 of them, the very best of the squad, every time. I can't rotate the players. Seems like a total wasted investment. Because that tiny team placed at the very last position of the league gets better of me no matter what. Yes I am not afraid of the fairly equivalent teams but those "LLLLL" form teams. I lost the league last season because of the continued poor results against the abandoned teams. I can admit losing one or two to poor teams but beaten/drawn throughout the third week when each time I was a favorite, seems very scripted. And sadly it haven't changed this season. Above 7 ratings for opponent defenders, Gk with below 50% avg skill sets made you question your whole scout level team. There you have my frustration. Either this or what can I say I am a very bad manager. Good evening to all the managers. Thanks. Nik, I did'n play Atletico f... Madrid, I played a school boy who had even +7 support bonus with all his FB friends on board of that goddamn Final. He didn't change a damn thing throughout the entire freaking game, but yet he turned around matters with that late 2-1 winning goal out of nothing, washing away my nice 1-0 lead up until minute 63. Shootouts are another story, but I can just say - ENGLAND, you'll get the point... never won a damn penalty-shootout in my entire f........ virtual T11 life, lost all 3 of them, including 2 Extra-time decisions, like I sad; "this is England!" Last edited by nikolgiorgos; 06-06-2017 at 07:47 PM. Palash Mitra and madflo19 like this. Last edited by nikolgiorgos; 06-06-2017 at 08:19 PM. Ποσιδονας and ibangali like this. lol, mcdaniel this is a classic troll game . It's one of the two games against the weaker team of the CH.L. group. If I could bet for a troll result of the season, that is the game.